Congratulations to Quailhurst Stables’ stallion Caletino and rider Darci Bayney on a double clear round in the $1500 Mini Prix at the Oregon Summer Classic in Wilsonville, Oregon. Darci is the owner/trainer of Zona Farms and this was the pair’s first Prix class together, with beautiful first round and jump off trips earning them a 6th place finish. “Riding such a talented horse is such an honor. I’m very thankful to Deborah Hausman for this wonderful opportunity and am looking forward to our next outings together,” said Bayney. The show was also a success for Caby (Caletino x Tjinja), a Quailhurst alumni horse owned by Zona Farms’ Rachel Van Allen. Still in his first season of jumping and showing, Caby took home multiple Championship and Reserve Championship ribbons from the jumper divisions with Rachel and Darci. 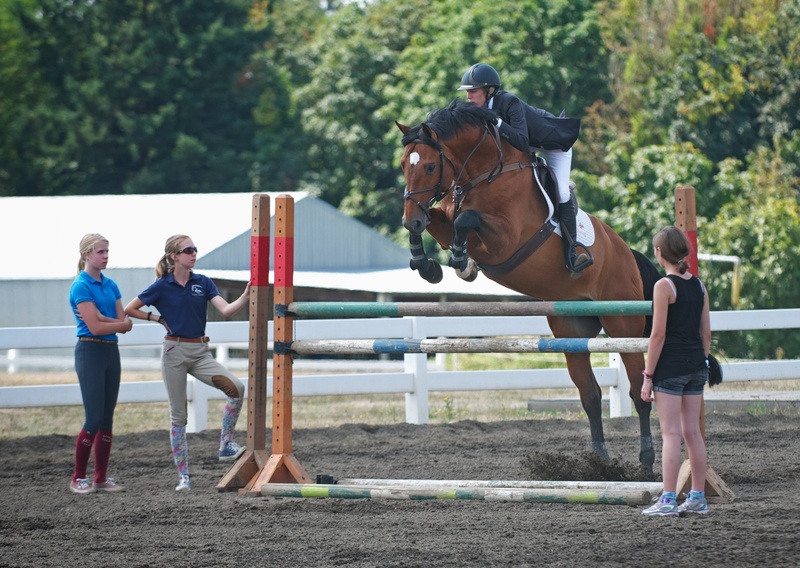 Both horses will be showing this week at the Northwest Spectacular (July 31-September 4) at Wilsonville’s Hunter Creek horse show facility, just 10 minutes from Quailhurst. Stop by to watch some showing and then visit Quailhurst’s Labor Day Vineyard Tasting (Sat-Sun 11am – 4pm). Above: In a great moment captured in the warmup for the Mini Prix, junior riders Savannah Budzinski, Rachel Van Allen, and Alexandra Crew watch their trainer Darci Bayney jump Caletino. Budzinski and Van Allen, both owners of Caletino offspring, are thinking how their own horses will be jumping like their dad someday!